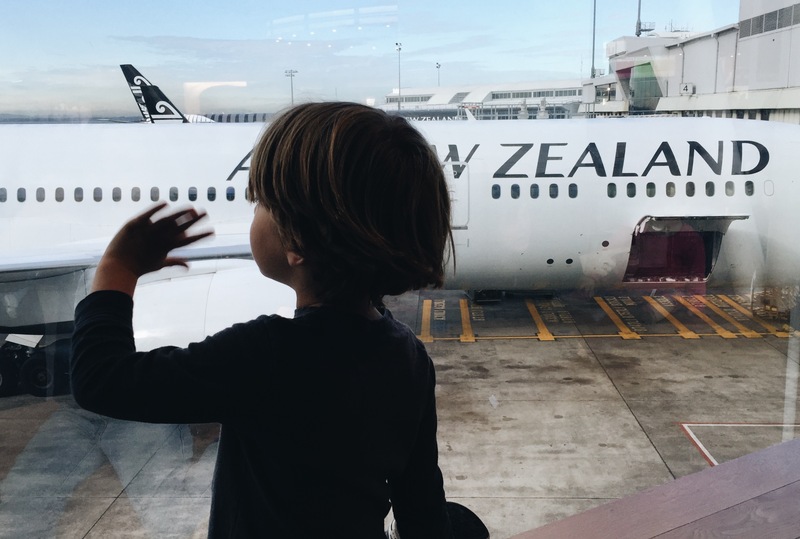 We’ve been travelling internationally since my son was 1-month-old, including many trips where I was flying alone with a baby, which as any parent who’s done it knows, can be very problematic. If you’re looking for our expert tips and packing list for flying with babies, toddlers and kids you’re in the right place – keep reading! 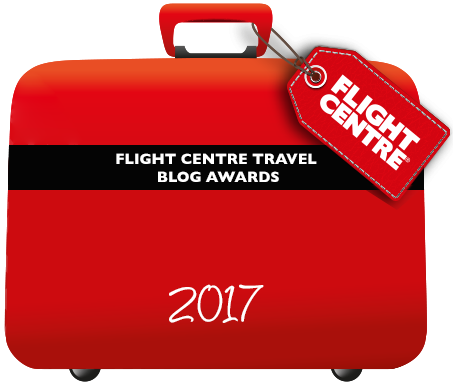 Our exploits include a year travelling around the world, involving a bunch of serious long-haul flights. After many mistakes, a lot of stress and tears, and a few small victories, I’ve finally managed to get my packing list and my airport routine down to a tee. 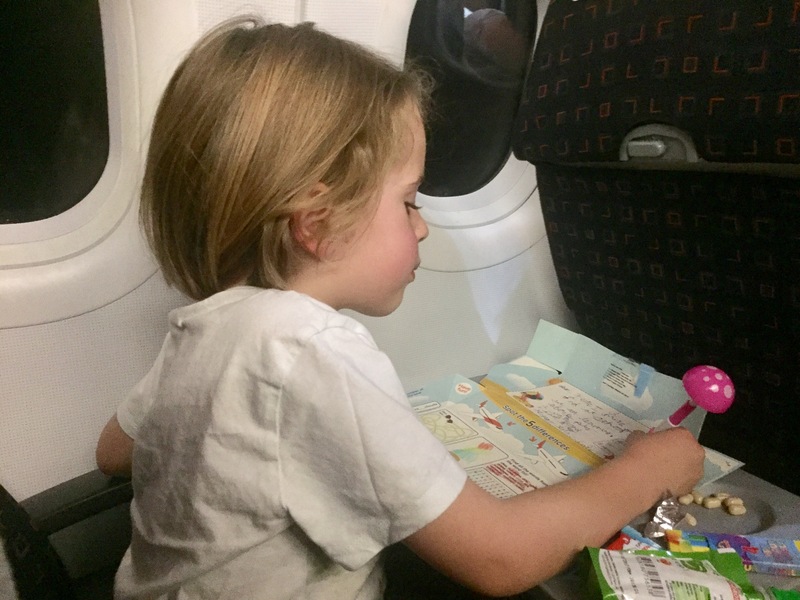 I’ve put together my ultimate packing list and top tips for flying short and long haul with babies, toddlers and older children. Head to the end of the article if you’re looking for our complete (and printable) holiday packing list for babies, toddler and kids. My biggest tip is… relax. I know it’s not easy, but don’t feel pressured because baby is crying, or your toddler is struggling to sit still – that’s what they do! Of course be mindful of your neighbours, and avoid bringing any noisy toys. Bring headphones, and make sure your kid isn’t kicking the front seat! For us, it helps when we make a big adventure of it all – most kids love flying, so create a fun routine around each part of the process to reduce tears. A lot of airports now offer complimentary baby strollers, but often these are only suitable for babies aged 6 months and above. A baby carrier or breathable wrap will save you from having to carry your baby around at the same time as your luggage, saving you energy. It’ll also help you keep your baby snug and safe during the flight, whilst allowing you to move freely / read a book / eat! It sounds obvious, but really do not underestimate how much your babies bowels will decide to exercise during a flight (in my case it was always on take-off and landing!). I always packed 3 x change of clothes for short-haul, and 2 x normal clothes plus 3 sleepsuits for long-haul flights. Better safe than sorry! Keep baby’s clean & dirty clothes organised, compact and separate with these cute packing bags. If there’s a queue at the toilet, don’t be afraid to ask if you can skip the line if you’re desperate – most people will be very understanding. If you’re bottle feeding, call your airport’s Boots to arrange to have your formula there when you pass through. It will save you having to boil water and prepare the bottles in the air. Try to organise your schedule a week or so before flying to try and coincide feeding times with take-off and landing – feeding will help baby’s ears pop. I suggest packing at least 1 x nappy per hour, or one more than usual. When packing wipes, think about packing wipes that are gentle on the skin like Water Wipes, and buy a small travel wipe case which you can refill during your holiday. It’s also a good idea to take some antibacterial wipes to clean surfaces on and off the plane. Pack a first-aid kit, as you never know when you’ll need it. It’s unlikely this will happen, but just in case your baby happens to develop a fever during a long-haul flight, pack a few calpol sachets – better to be safe than sorry. 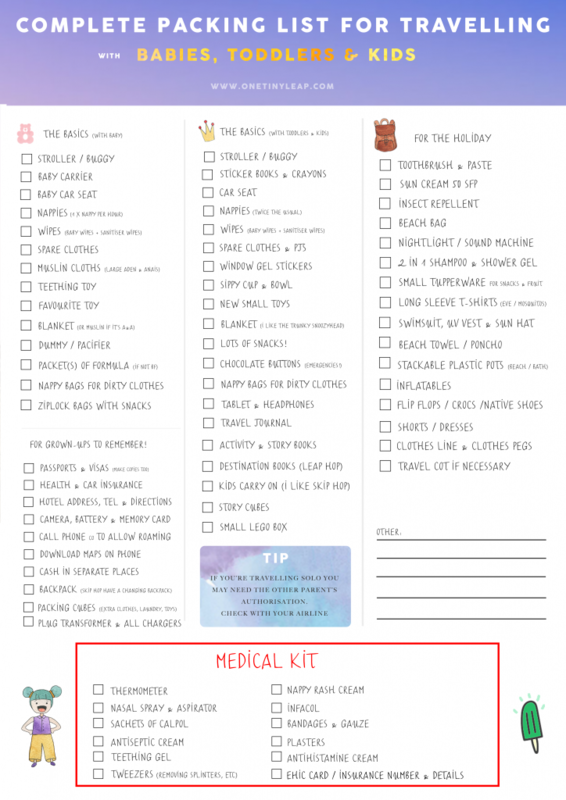 For a full list, refer to my ultimate packing list for babies at the end of the post. There’s nothing worse than feeling awkward because you’re that lady/guy with the baby (pff to that), but try to avoid difficult situations by booking an aisle seat. This lets you walk the length of the plane easily if your baby needs calming down/a change. 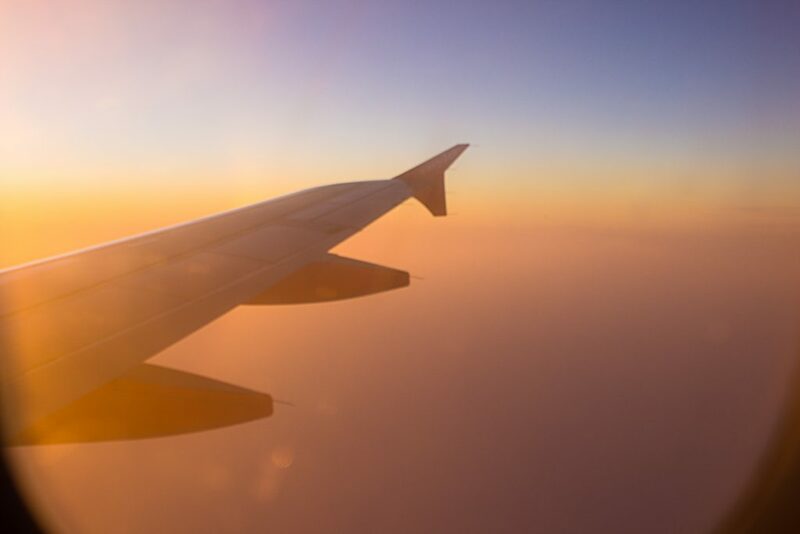 If you’re travelling long-haul then you can often get in touch with the airline in advance to secure a bassinet, and check whether you need any other documentation, such as a birth certificate, or if you’re flying solo with baby, an authorisation from the other parent. Minimise the amount of times you need to change your baby’s nappy on the plane by planning ahead – change just before boarding so baby is dry and happy! And of course, don’t forget a portable changing mat – it’ll transform just about any surface into a changing facility. It might sound dramatic, but when my son was very young the Aden and Anais muslins saved my life! I used mine as a breastfeeding cover, blanket, to mop up sick, to play peek-a-boo and as a sunshade draped over my kid’s buggy (make sure to keep to leave a good gap for air to flow freely if you do this, and that it’s not too hot for baby). Remember you’ll want to have free hands to carry baby, get passports, etc, so the last thing you need is a one strap bag getting in your way. I’d definitely consider swapping your changing bag for a more practical and bigger rucksack – the one I’ve linked to has separate compartments for bottles, nappies, etc, making it a nice transition from a changing bag, but a normal rucksack with pockets will obviously work just as well. Just a few tips to get started: you can bring all the toys you can fit into your hand luggage, but your toddler’s attention span is minuscule so avoid taking anything too bulky. One of the best tips I’ve heard is to wrap little toys individually so that they are constantly entertained and feeling like they’re getting a big treat. I also buy a few activity books at the airport, which I let my kid choose – they feel extra special and it will take longer for the novelty to wear off. Try to keep a few special items and treats to take-off and landing, as staying still with the seatbelt on can prove difficult for little ones. Kids LOVE stickers! They’re obsessed and never get bored of them. Of course you’ll leave the plane covered in glittery butterflies and Thomas the Tank Engine, but who cares if it makes the flight easier, right? Pack LOTS of snacks. Just like a gooey chocolate cake makes me happy, so do healthy snack to little ones. I love the small boxes of raisins for travel – they are a godsend when you’re thousands of feet in the air and struggling to keep your toddler from escaping his/her seat. Raisins take foreeeeever to eat, and should give you a fair bit of peace…In case of emergency break out the chocolate buttons! The likelihood of leaks, etc are much smaller than with babies, but you’ll still need to be prepared. Take one spare set of clothes, and PJs if travelling long-haul, to help them sleep. If you want to win parent of the year award, get them new pj’s so they feel excited to go to sleep. We don’t use our tablet much, but do always take our Amazon’s Fire Kids tablet when travelling. This tablet is great as it comes loaded with games, and you can download Cbeebies shows onto the iPlayer app – find out all you can download here and read my full review of the Amazon Fire here. It also features a fantastic parent control dashboard where you can choose just how long to let your kid play with what! Peppa will be your best friend on a plane. If you’d rather your child played with a more educational tablet, the Leap pad is a great option. I love this idea from How to be awesome at everything (great blog name!) of using gel stickers on plane windows. This will transform the plane, and should keep your little one busy for at least 10 minutes. They don’t leave any marks either so the stewardesses shouldn’t mind! Now your child is at an age where they’ll be able to dive into a book, make the most of it. I’m sure you know what makes your child tick, so go to the airport’s WH Smiths and grab a few new activity books to keep them occupied. We’re very fond of ‘Where’s Wally’ type of books, as they keep children busy for hours, and the destination-focussed Leap Hop books are a winner in our house. If your child is prone to motion-sickness, then stocking up on audiobooks and podcasts is a great solution. We’re big fans of them, and the complete collection of Julia Donaldson’s books have kept our kid happy (and us slightly insane) during very long road trips. For plane journeys, get some kid-safe headphones. Alongside bringing their pjs, toothbrush and cuddly toy along for a long flight, a comfortable travel pillow and blanket can make all the difference when trying to get little ones to have a good night’s rest during a long haul flight. I love the Trunki SnooziHedz blanket, as the pillow and blanket are connected, and there’s a handy little pocket for their toys too. A lot of people swear by Trunkis but I’m not a huge fan. Although I think they can be fun, I found them flimsy and thought they offered very little packing space. We have used the Skip Hop ‘Bee bag’ for over 3 years. It survived a round the world trip during which we moved every four days, many flights and stays at grandma’s house. Together with its toddler backpack (we have the penguin) it’s a winner in my book. Need more inspiration? Have a look at my Pinterest board full of DIY activities to take on planes, plus lots of articles with tips from other bloggers. Do you have any ingenious tips? 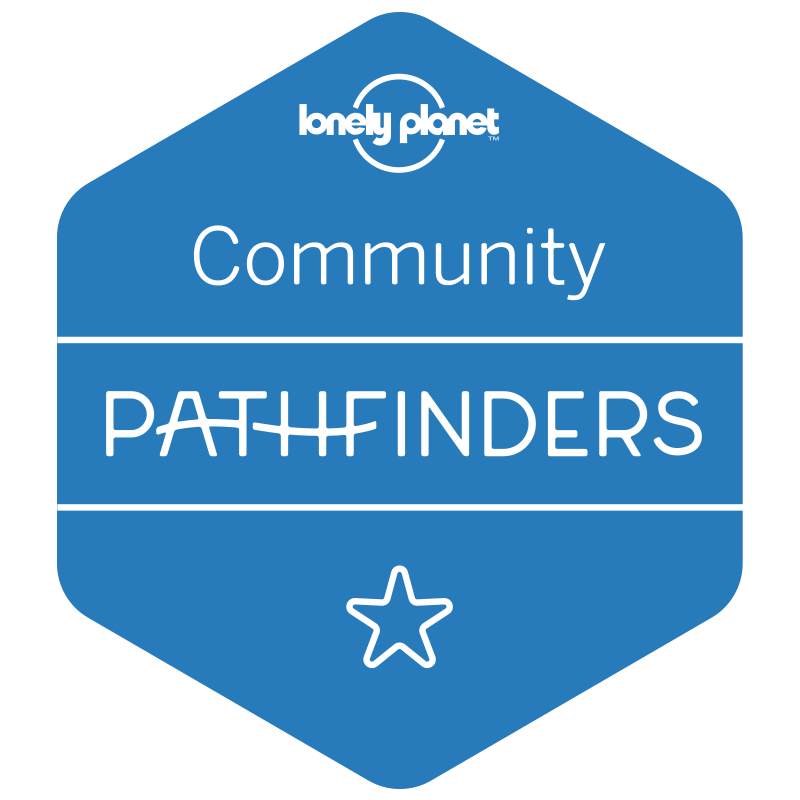 Please share them with our community in the comments, or get in touch with me by email and I’ll add them to the list.